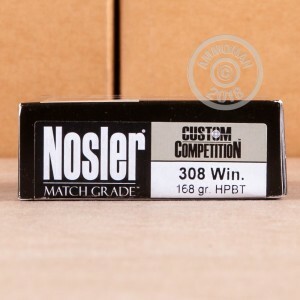 This .308 Winchester ammunition from Nosler is a top quality load that delivers match-winning accuracy. Each cartridge in this box of 20 fires a 168 grain "Custom Competition" boat tailed hollow point bullet engineered for maximum stability and ballistic efficiency. These rounds are optimized for 1:10 twist barrels and use non-corrosive Boxer primers and brass cases. Nosler of Bend, Oregon is known for producing a variety of high-end precision shooting loads for hunting, defense, and target use. Founded in 1948, the company has also branched out into the firearms business and produces a variety of bolt-action and AR-15 pattern rifles. 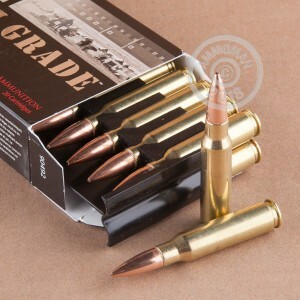 Remember to save on your next batch of ammo with AmmoMan.com's free shipping promotion, which applies to all orders over $99.